Today’s post features an article I wrote for Piano Professional Magazine (an EPTA or the European Piano Teachers Association publication). It was published in June this year, and focuses on a few practice suggestions for counterpoint (or polyphony). There are so many different ways to work at this demanding style, and my thoughts are based on my own approach. I’ve included a link to the original article at the end of the post, and a downloadable PDF with twelve tips for students, teachers or anyone who loves practising the piano. Hope you find it helpful. Polyphonic writing has been a popular compositional technique in Western music for over six centuries. It’s a method of writing favoured by a vast collection of composers, irrespective of their style and genre. Responsible for producing some of the most complicated, intense and beautiful music ever known to man, it’s a form which piano students must grasp thoroughly, as otherwise progress in piano playing will be challenging; at every stage of pianistic development and at virtually every music exam, pupils are expected to perform a piece constructed in this manner. The art of playing many lines of music at the same time can cause a myriad of issues for students, and the study and practice of this genre requires a very different approach to that of a texture consisting of a melody and accompaniment (known as Homophonic style). Countless composers from the whole spectrum of Western music have employed contrapuntal techniques; from Beethoven to Bartók, and Busoni to Shostakovich. However, arguably the greatest and most prolific era of this style occurred during the Baroque period (approximately 1600 – 1750). J. S. Bach (1685 – 1750) was of colossal importance in the Baroque period’s golden polyphonic era, and his music provides a fundamental element in today’s piano repertoire. Polyphony emerges in many guises and forms; from preludes, fugues, suites, and dance movements, to appearances in concerto movements and sonatas. In the Baroque period (and earlier), these pieces would have been played on completely different instruments; the harpsichord, organ and clavichord. The clavichord was, by all accounts, J. S Bach’s favoured instrument for performing his keyboard music. The possibility to vary the sound and colour, coupled with a slightly more responsive feel, undoubtedly played a significant factor. This provides insight into the performance of Bach’s music; and whilst much of his work may be described as generally highly rhythmic with continuous repeated patterns, it requires a level of musicianship, depth and commitment rarely witnessed in other genres. Learning any polyphonic work will require a substantial amount of analysis or study especially at the start; it can be helpful to take the score away from the piano. The linear element is the main focus in contrapuntal music, therefore the following observations will be vital; the shape and construction of each melodic strand within the contrapuntal texture (especially the thematic material), the key (particularly key changes), cadential points, how the melodic material develops, changes, or migrates throughout the piece. Counterpoint usually consists of two or more lines or strands of material, and if a work such as a fugue is to be studied, three or four lines of texture will be evident. Once the score has been ingested, it can be useful to lay each part out on a separate stave, separating the textures, allowing complete understanding of where the music is going. I find absorption of each part is quicker this way. 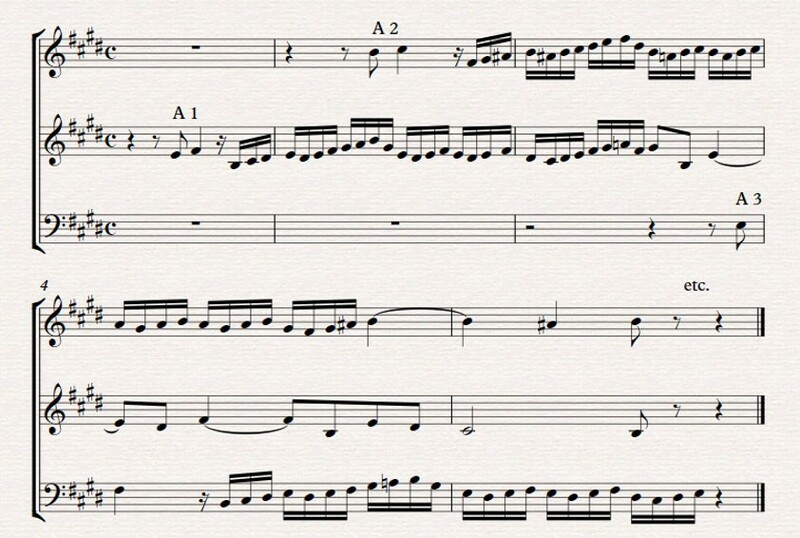 Students might find it beneficial to write the whole fugue out in this manner. It’s important to note each entry of the subject particularly, as this guides interpretation and also dictates articulation as well. In the example above (Fugue in E major), I’ve marked the subject and it’s three entries at the beginning (A1, A2, and A3) in each part. I encourage pupils to do this throughout a work, every time each entry appears (writing a piece out in this way assists with memory and really ‘knowing’ a piece). Once the melodic material has been marked up and each strand of music has been grasped, work through the piece deciding how the texture will be divided between the two hands; sometimes two parts can be taken with either the left hand (LH) or right hand (RH), but occasionally the most convenient interpretation will see the subject, and subsequent material (often a countersubject, or an ‘answer’ to the subject), divided between the hands. Taking the fully digested score to the piano, now is the time to mark up the most ideal fingerings. This will take time and will involve working hands separately, carefully observing comfortable hand positions, and the necessary movement needed to play each entry with a warm sound and varied tonal colour. This may involve certain hands movements, and a ‘leaning’ on particular fingers in order to create the desired sound within each strand or line of music. Aim to write as much in the score as possible; this will serve as an important prompt until the piece is really learnt. Returning to the three-part score (which has now been written out), ask students to play each voice (each musical line) separately (using the correct fingerings, which may feel tricky at first). This could be extended to other thematic material too, disentangling various strands of texture, providing a feel for the musical content as a whole, whilst getting to grips with the various shapes and patterns within the piece. Rhythm plays a paramount role in any contrapuntal work. In some cases, the pulse can be relaxed a little, taking slight ritenutos into consideration (mostly in improvisational passagework or at the end of a piece), but whilst playing fugues, dance movements and the like, a very firm rhythmic inner pulse is the secret to the ideal rendition. Encourage students to sub-divide the beat and count in semiquavers (or the smallest rhythmic denomination within a piece). A metronome can help, but I find counting every note (regularly and throughout the piece), the surest way to develop a reliable inner pulse. Each hand will require a huge amount of practice on its own. It’s generally acknowledged that separate hand practice yields the best results, however, polyphonic music commands slow, pedantic, laborious work in this way, often for a substantial period of time (especially if a student hasn’t played much of this genre previously). The key to mastering polyphonic music is extremely slow practice. The slower, the better. Each hand must know what it’s doing to the point that it can, not only play fluently (free from hesitations and with all correct rhythms), but is totally independent of the other hand, and as though the patterns and shapes could almost be played by rote, without too much thought (so as to allow focus on purely musical concerns). Outer fingers (often fifths), will benefit from playing deep into the key bed, employing the fingertip, which will gradually encourage them to gain strength and produce a larger sonority. Students sometimes find the inclusion of multiple touches helpful in a work such as the Prelude; slow non-legato, dotted rhythms and accents on different beats of the bar, especially on unexpected beats. Experiment by using accents on beats two and four; both pertaining to the crotchet beat as well as the second and fourth semiquaver, within each crotchet beat (if the speed is very slow), which can be amazingly effective, and will definitely help with any coordination issues. When practising hands together, assume one beat at a time to begin with, placing each note carefully and with focus, being mindful of the rhythm, as well as notes and fingerings. Mastering a fugue, beat by beat can certainly pay dividends, and when learning bar by bar (after each beat has been successfully negotiated), always stop over the bar line (or over onto the next beat if practising in crotchet beats). This will help with continuity, as it’s vital to be able to ‘pick up’ from any spot within the piece. Now that your student is playing their fugue (or any polyphonic work), slowly and accurately, try suggesting they sing one voice (or line) whilst playing other linear textures at the same time. This might sound perfunctory and out of character (for this style), but by returning to the original concept of thinking about each strand in a polyphonic work’s texture, the act of playing one part and singing another can be very useful, and will cement learning. Memorization is not necessary for those taking higher graded exams or some diplomas, but the act of remembering and ingesting all the information in a contrapuntal piece will only aid fruitful learning. Assimilating where subject entries occur, whether by singing, playing, tapping the pulse, or becoming acclimatised to the muscular movements (or a mixture of all the above! ), within a piece, will eventually result in being able to remember the score, and most pupils find this valuable, even if they don’t plan to play from memory. Focused practice of any kind for long periods of time, tends to assume this outcome. Articulation and ornamentation in polyphonic music can be a minefield, and are often deemed personal taste. Generally, we are not privy to any Renaissance or Baroque composer’s intentions; phrase markings, any accentuations or rhythmic inflections can be difficult to gauge, particularly if (as is often the case) nothing has been written in the score. The following favoured practices may be taken into consideration: notes with longer time values, such as minims, crotchets, quavers, are effective when played non-legato (or slightly detached), whilst semiquavers and shorter note values, are best played legato. However, there are many exceptions to these ‘rules’. In order to interpret any polyphonic material, a degree of ‘separating’ notes will be necessary, and there are many varying degrees of separation, from staccato and staccatissimo, to tenuto or portamento. Appropriate touches will depend on many components including speed, character, harmonic context, and rhythmic patterns. Ornaments are best left out when learning a work, as they tend to disturb the pulse, and can be the cause of hesitations and uncertainties. Eventually, most pupils will feel the pulse and play seamlessly, and as this happens, embellishments can be gradually introduced. In order to produce even, rhythmic ornaments, suggest students practice the intended embellishment incredibly slowly, powerfully, with finger strength (and a free wrist and arm). Once the pattern has been studied and can be played with ease, lighten the touch to reveal even, added notes. Then insert them at the appropriate place within the piece, slowly building speed until they feel and sound comfortable and natural. Colour and voicing will become a deciding factor in the success of a performance. This is an issue which can be resolved from the outset (as can articulation), if tonal importance and rhythmic clarity is instigated when playing each melodic strand separately at the beginning of the learning process. Ensure melodic material such as a subject (in a fugue) is always clearly enunciated on every entry, and the accompanying material is sub-ordinate. Deciphering where textures rise and fall will be a consideration too; one tip is to allow a (very) slight hiatus after a climax, so the music is given time to breathe, and doesn’t feel rushed (but don’t be tempted to use rubato!). Resist the urge to pedal with alacrity. Frequently depressing the sustaining pedal will merely smudge and obscure the numerous lines of music, which must ring out, allowing the listener to hear the textures clearly. The sustaining pedal may be used sparingly, to highlight specific points in the score, and to provide resonance. Tonal clarity, rhythmic precision and above all, musical integrity, will ensure a beautiful performance of any polyphonic piece.